Samuel, Viscount Ellery is ready to marry, and his position, demeanor and reputation should prove no obstacle. But, he’s unlucky: each woman he has pursued has gone off and married someone else. Determined, if a bit cautious about the marriage mart, he’s decided to host a house party to which he’ll invite some close friends, a few select eligible debutantes and hope for the best. Sam is a wonderfully complex and gallant man: he’s laden with a generosity of spirit and a genuine goodness, along with a true desire to find that one woman to make his own, that you can’t help but be drawn to him. Gemma is traveling about with her aunt, the Dowager Duchess of Vale. She’s enjoying the travel and seeing new sights, best of all there are no whispers behind gloved hands or outright disrespect shown her because of her father’s sins. See, Gemma’s father is a nororious thief and while she herself has led an honest life, the snubs and gibes, not to mention the impact on her opportunities for a good marriage are all reasons to avoid society at all costs. Gemma is fortunate that her aunt, being well titled and unconcerned with the snubs from society has taken her under her wing. She sees (as readers do) that Gemma is wonderfully sweet, kind and genuinely a good catch, for the right man. A stop for a leisurely wade in a pond during the warm afternoon places Gemma and Sam in proximity, the pond is, after all, on his land. A quiet conversation is struck up: both seem to be intrigued with the other, and the connection between the two shows a kinship that could easily lead to love. Embarrassed by her gaffe of wading in the Viscount’s pond, she can’t resist when Sam, finding them at the inn, issues an invitation to the party at his house. He’s intrigued by Gemma, and wants to know her better. Of course, the other debs at the party quickly ferret out Gemma’s notorious connections, and quickly work to isolate her from the group and from Sam, who will not be denied or put off. He’s intrigued by her and discovers the real woman beneath the stories: her heart, her shame and her concern to not burden any man with her paternal connections mean little to him, and he increases his pursuit, showing her that he sees her as she is, not who she is. Wonderfully built, these two characters arrive fully formed and develop a relationship that is easily described as ‘eyes for only one”, much to the delight of the Dowager Duchess and the dismay of the debutantes at the party. Engaging, heartfelt and smile-inducing, this is a wonderful installment in this series. 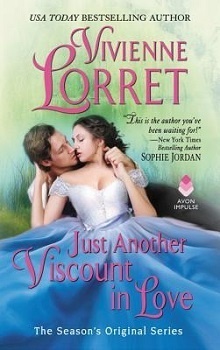 A brand new story in the Season's Original series from USA Today bestseller, Vivienne Lorret! As the toast of the ton, Samuel Wortham, Viscount Ellery, should have no trouble finding a wife. Yet each lady he pursues ends up married to another. As a last hope, Sam plans a house party, intending to choose a bride from one of his guests. But when he encounters a raven-haired beauty by his estate’s pond, he’s captivated by her charm and desperate to see her again. A quiet trip to the country is just what Gemma Desmond needs to take her mind off marriage. After all, as the daughter of a notorious criminal, her prospects seem quite grim. The last thing she expects is a chance meeting with a handsome lord and an invitation to his lavish house party. Ellery is everything she hoped for in a husband. But can she ever escape the stigma of her father’s misdeeds? USA Today bestselling author, VIVIENNE LORRET loves romance novels, her pink laptop, her husband, and her two sons (not necessarily in that order … but there are days). Transforming copious amounts of tea into words, she is an Avon Impulse author of works including: Tempting Mr. Weatherstone, The Wallflower Wedding Series, The Rakes of Fallow Hall Series, The Duke’s Christmas Wish, and the Season’s Original Series.